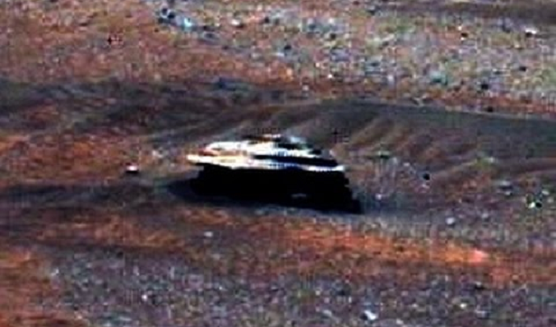 A curious individual found what appeared to be a metallic ship on Mars. An anonymous witness states that JPL has just completed its upgrade of MSLs software and announced that science can continue. According to the witness, the word science may have different meaning when it comes to the exploration of Mars by JPL. Referring to an object on Mars’ surface that look like a hubcap, the witness believes that NASA tried to hide a metallic UFO by altering the image using an editing software, such as Photoshop. The witness alleged NASA of cover up by obscuring the UFO with artificial rust pixel. After removing the artificial rust pixel, the witness claimed to have seen a metallic spaceship on Martian surface. The witness believes that the rover encountered the mysterious ship but could not detect it with any of its so-called science equipment. The witness adds that the rover might have been busy drilling again and failing to notice the spaceship. It seems the rover….roved all around this object, but couldn’t detect it with any of its “science” equipment….must have been busy “drilling” again? Funny how the BIG GUNN Mast camera has been too busy looking at its disintegrating wheels to take any new HD images of the looming Mount Sharp summit. No that job has been allocated to the rock camera MAHLI (designed to image objects close to the rover). Do you believe that NASA has been hiding something related to aliens or extraterrestrials on the Red Planet.